Illinois native and Northern Illinois University graduate Sebastian Maniscalco has been on comedic roll for some time now. 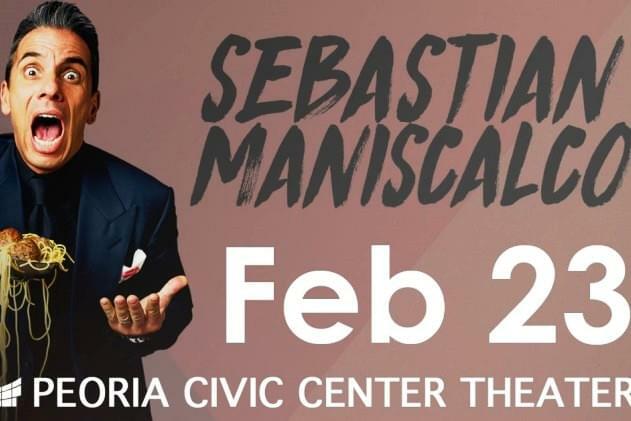 Maniscalco returns to his home state on Saturday, February 23, to play two shows at the Peoria Civic Center Theater at 7p and 9:30p, the second show added when the first one sold so well so quickly. Tickets are still available at the box office and online by clicking HERE. And during my 4 O’clock hour this week (M, 2/4 – F, 2/8), listen for your chance to win a pair! Tickets provided by Nitelite Promotions. Sebastian moved from the Midwest to Los Angeles and then worked his way to the top of the comedian food chain, making visits to all the late night TV talks shows and acting in a half dozen films. He cracks on his very Italian upbringing and that of his very Jewish wife, Lana’s, too. In 2018, he published his memoir, “Stay Hungry,” and that’s the name of his national tour. See the very funny Sebastian Maniscalco perform twice in Peoria, Saturday night, February 23, from Nitelite Promotions and Peoria’s home for classic rock and comedy, 95.5, GLO.